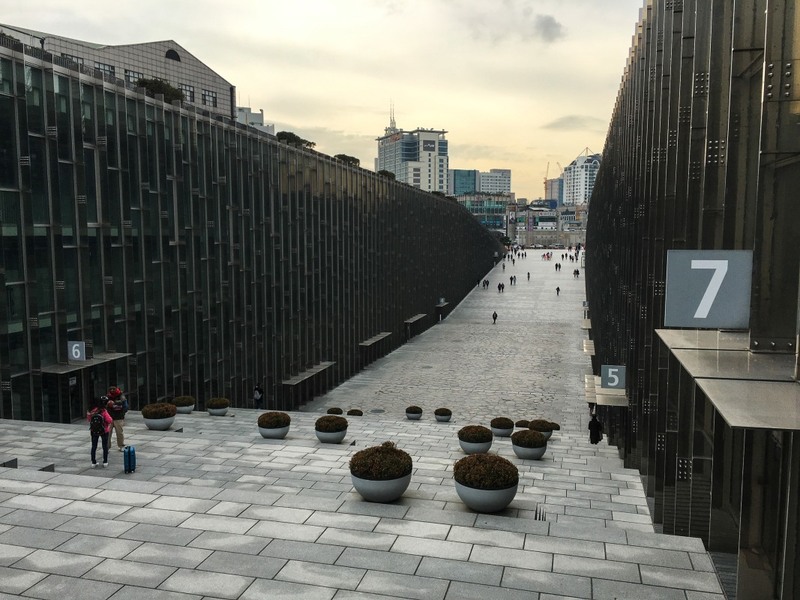 The Ewha Womans University is one of the most unique and beautiful buildings I’ve ever visited. You can walk into its central valley, which starts as a gentle slope, turns into an intimate plaza between the two buildings at its lowest part, then becomes a majestic staircase that brings you back up. You can walk back on the roofs which start at the highest point of the site and slowly slopes down though meandering gardens all the way to the lowest point, where the previous valley slope begins. You can go from ground to roof back to ground seamlessly. It is all so well designed and constructed, and it is essentially Perrault. 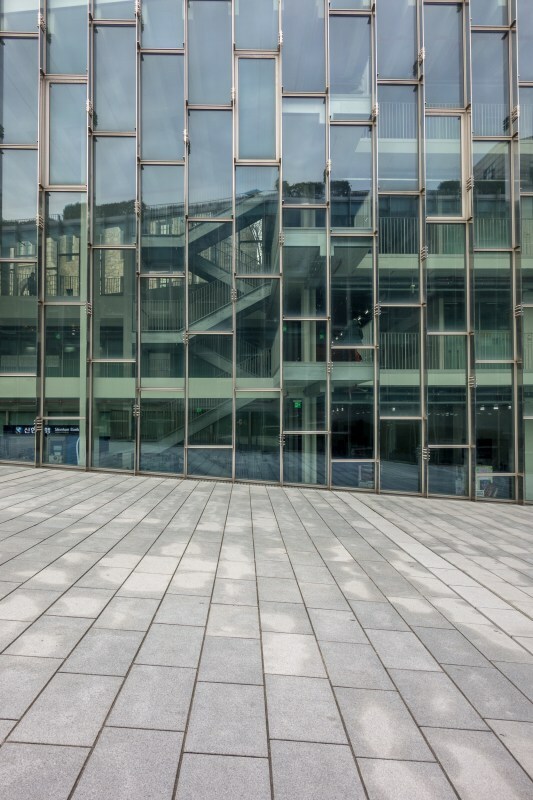 If you visit the Paris Library or the Berlin’s Velodrome, you’ll see the pattern: large buildings set not on the site, but within it, buried, mixed with the earth and creating spaces up, down and above the ground level, all interconnected and seamlessly accessible. It seems public access and circulation, as well as multiple ways of using the spaces, are always a prerogative. 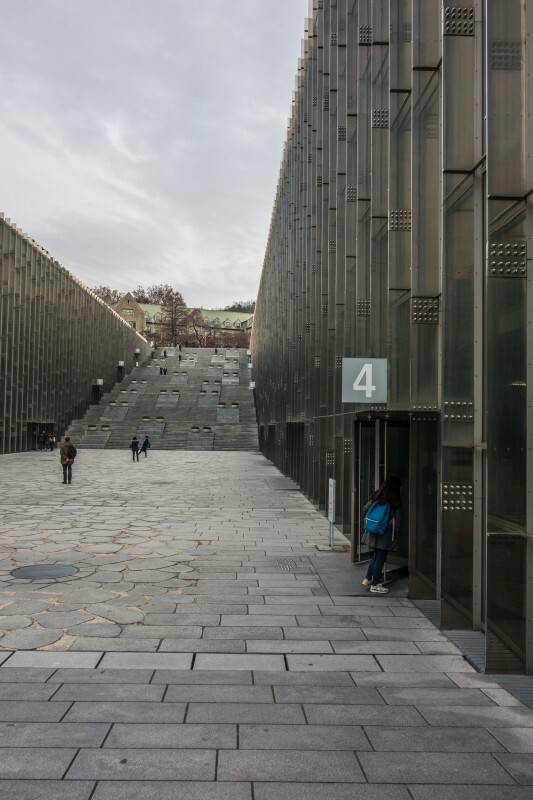 His building at Ewha is another realization of these ideas, and it works so well. The facades to the central valley are also incredible. From the entrance to the valley, they look solid, like real rock cliffs in a rocky valley. 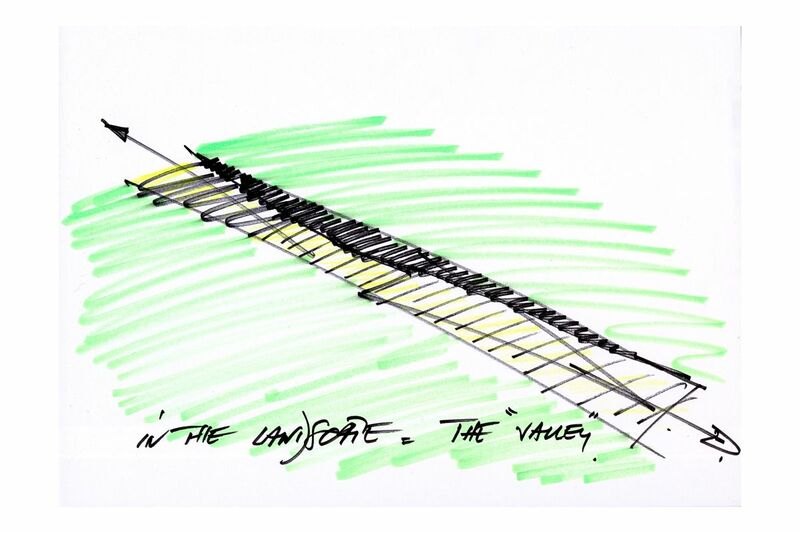 But walk down the valley, and it reveals itself as an elegant pattern of stainless steel and glass, giving the transparency necessary to the activities inside. And it also creates a wonderful display of the building’s life. You can see people moving, people gathering, the building being used. It invites you in. I was in awe when I visited it. Mesmerized by the ingenious public space it created. Impressed by the details. It is one of those building that makes you excited about being an architect, about the possibilities to create unique and fantastic spaces and experiences. And it also confirms Mr. Perrault as one of the greatest, and certainly one of my favorites. It is a university, but open to the city. There are no closed gates or identity checks. Do plan to spend some time there, and take your time to take the project in, just sit and watch. The building is also open during regular hours, but as a university building, it politely asks visitors to keep off of classroom areas. There are some public areas at the bottom of the valley where you can get in to take a peak. You can reach it either by subway Line 2 (stop Ewha Womans University) or Gyeongui Jungang Line (Sinchon stop).